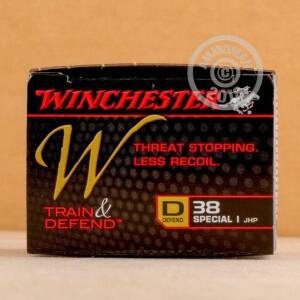 This .38 Special ammunition from Winchester is part of the "Train & Defend" series. 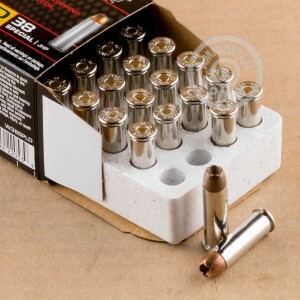 Each cartridge in this box of 20 fires a light 130 grain jacketed hollow point bullet at about 900 feet per second, producing mild recoil to enable faster follow up shots. As a standard pressure load, they will work well in both large and small revolvers. 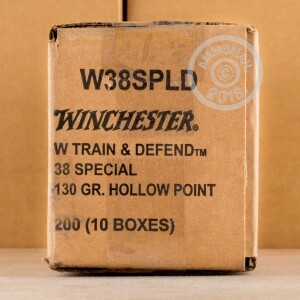 Winchester Train & Defend ammunition consists of matched pairs of premium hollow points and inexpensive full metal jacket rounds sold in boxes of 20 and 50, respectively. Each pair of T&D ammo has identical ballistic properties. T&D loads leverage advances in hollow point bullet design to produce reduced recoil without sacrificing terminal performance. Like other Winchester products, this Defend ammo is manufactured in Oxford, Mississippi using non-corrosive Boxer primers and brass cases.